How well we inspire kids to be loyal to God, who created us “by design,” has eternal consequences! 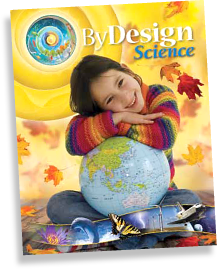 Kendall Hunt Publishing Company is pleased to announce By Design Science, your new customized inquiry science program for grades 1–8. The program has been developed collaboratively by the Seventh-day Adventist North American Division Office of Education and Kendall Hunt Publishing. At this time, grades 1–6 are available in inventory and grades 7–8 will be available for the 2014 school year. The By Design Science program aligns with the NAD Elementary Science Standards and has been developed for both traditional and nontraditional classrooms. The program is built on a foundation of inquiry that encourages wonderment, questioning, collaboration, and exploration of multiple resources to conduct research and investigations. This engaging, rigorous, and developmentally appropriate curriculum nurtures children’s natural curiosity as they explore the wonderment of God’s Creation through the lens of the Bible. Q. What is unique about the program? A: The By Design Science program is completely customized, unique, and new! This new science program is innovative and multidimensional in content and organization and offers a balanced and integrated development of science and health within the framework of the Adventist worldview. By Design Science focuses on the users’ experience so that all elements of the design invite, engage, instruct, and motivate students and teachers to continue learning and building their science knowledge, as well as strengthen their connection with their Creator. The By Design Science program has a strong foundation based on a 5-step instructional model. This teaching model is used to promote inquiry-based learning and to stimulate a natural desire for knowledge. The program is organized into four units of study: Life Science, The Human Body, Earth and Space Science, and Physical Science. Q: Can we see some of the materials now? A: Samples pages are located on the website adventisteducationbydesign.com. Q: What is the program's cost? A: Grades 1-4 Student Edition $49.95, Teacher Edition $135.00, Student Science Journal $18.00; Grades 5-8 Student Edition $64.95, Teacher Edition $155.00, Student Science Journal $22.00. Please note that all teachers will need a Teacher Edition for each grade level that you are teaching. All students will need a Student Edition and Student Science Journals. Based on your classroom needs select the science journals for a traditional 1-8 classroom or science journals for teaching a multi-grade classroom. These are available for grades 1-4 and 5-8. For teaching the multi-grade classroom students, you will need a Teacher Guide. You may consider teaching in another model. The program is designed to fit your classroom needs. The Student Science Journal is an integral component of the program. It is used as a recording device for the scientific inquiries presented in the Student Edition, and also provides additional inquiry labs and information on critical concepts and Adventist worldviews. Each Student Science Journal becomes an individual record and journal of the student’s work throughout each unit of study. Also included at the beginning of the units are Lifestyle Challenges and Open Inquiries that will span the duration of the unit being studied. There is also a Faith Connection and Home Connection feature for each chapter. Students will record and journal about their understanding of the lesson content and how this relates to their Adventist education and faith. The Student Science Journal features a unit review for grades 1–4 and an end-of-chapter review for grades 5–8. The reviews are used to assess and summarize what students have learned. The end-of-unit Engineering Practice feature extends additional learning opportunities. Q: When real scientists conduct inquiries, they also read what other scientists have discovered on the topic. Does By Design Science present a rich explanation of science information and concepts related to the inquiry activities? A: Yes, both the Student Edition and the Teacher Edition provide background information including science history, recent discoveries, Adventist scientists’ contributions, and what is currently known on the topic. Chapter features include People/Careers in Science, History of Science, and Science and Technology. Students are invited to conduct additional research to gather their own information. Q: Are accommodations provided in the instructor’s textbook for students with special needs? A: Suggestions for working with students with special needs are provided in the Teacher Edition. Q: How many days a week should we teach science and for how long? A: Science should play an important and integral part of a student’s elementary education. We realize that science time suggestions/requirements vary by Union and Conference. Some schools teach science every day for 30 to 45 minutes. Other schools teach science every other day for an hour. Recommended program pacing guides are provided in the Teacher Edition. Q: Which Bible version are the scripture references taken from? A: The scripture references are taken from the New King James Version of the Bible. Q: Does this program take the place of the science activities that presented in Pathways? A: No, the science activities in the Pathways Language Arts program are connected specifically to the content of Pathways. However, if there is a repeat of content, the teacher could choose to teach the content in connection with the program or in isolation. Q: What about the multi-grade science classes? A: The multi-grade classroom model was thoughtfully considered and addressed in the By Design Science program. Similar to the SMART guide materials, the By Design Science program provides resources for the multi-grade teacher. The resources align the topics across grades 1–4 and grades 5–8, allowing a teacher with multi-grade combinations to teach the same topic across grade levels. This is accomplished by rotating instructional topics through a four-year cycle. You would use one Student Science Journal set per cycle. The Student Science Journal is organized by unit for grades 1–4 and grades 5–8. These customized journals follow the topic alignment chart developed specifically for multi-grade classrooms. Q: Is the student text in the multi-grade cycles in grades 1–4 and 5–8 written at a similar reading level? A: Each of the individual Student Edition texts has been written at grade level. The grades 1–4 multi-grade Student Science Journals are written at approximately a grade 3 level, and for grade levels 5–8 the Student Science Journals are written at a grade 6 level. The multi-grade Student Science Journals contain unique and customized materials. Q: Will the multi-grade classroom using the new By Design Science program replace the SMART guide we are using now? Q: Are scoring rubrics provided for assessing student projects? A: Yes, scoring rubrics are provided. These are located on the Teacher Resources site. Q: Will teachers have to make up their own test questions? A: No. Opportunities for formal assessment, performance assessment, and informal/ongoing assessment are provided within the program. Formal Assessment: The By Design Science program offers several opportunities for formal assessment. To help you reinforce and assess student understanding of chapter objectives, each lesson is closed with a lesson summary and review and each chapter includes a comprehensive chapter test. You are also provided a Unit Review that you may use as a formal summative assessment. Performance Assessment: Suggested authentic performance tasks are provided in the Teacher Edition at the close of each lesson. Students are encouraged to use scientific knowledge and practices to complete the tasks. You are provided a scoring rubric for each suggested performance assessment. An inquiry that assesses students’ applications of engineering practices is found in the Student Science Journal at the end of each unit of study. A scoring rubric is provided for assessment of this Structured Inquiry. Formative/Ongoing Assessment: There are many opportunities to observe and evaluate student growth and understanding during regular classroom instruction. By Design Science provides opportunities for informal/ongoing assessment in several ways. For grades 1–4, “Think About It” questions found throughout each lesson encourage higher-level thinking and apply to the lesson content. Throughout the Teacher Edition, point-of-use boldface questions are provided that can be used to assess student understanding and application of lesson content. By Design Science provides additional practice support pages for each lesson. Also provided are Skill Builder masters that support continued development and assessment of scientific and engineering practices, as well as other important skills needed in the learning of science. Q: How will we follow the topics in the multi-grade cycle if the Student Edition will be on grade level with different topics? A: The format of By Design Science is similar to that of the SMART materials, where information is pulled from all four grade-level texts. Q: Are multi-grade Student Science Journals available for grades 1–4 and 5–8? A: Yes, there is one Student Science Journal set per cycle organized by unit for grades 1–4 and grades 5–8. The customized journals follow the topic alignment chart developed specifically for multi-grades classrooms. The By Design Science program provides resources for the multi-grade teacher. The resources align the topics across grades 1–4 and grades 5–8, allowing a teacher with multi-grade combinations to teach the same topic across grade levels. This is accomplished by rotating instructional topics through a four-year cycle. Q: What standards were used to develop this program, and have those been published? A: Presently, the Next Generation Science Standards (NGSS) have been correlated to the program. Additionally, as we have been working on the development of this program for many years, another document was used to assemble the By Design Science detailed scope and sequence: the 2008 Curriculum Guide for Science, grades K–8, written by the Office of Education for the North American Division of Seventh-day Adventists. Revised NAD Elementary Science Standards are being developed and will be aligned with By Design Science lessons. These will be available on the SDA/NAD website. Q: How many students will a single grade kit accommodate in the By Design Science curriculum? A: The kits (grade level and multi-grade) contain enough materials for four student groups. The teacher can determine how many students per group. This supports a collaborative learning environment as well as a flexible teaching environment. Q: What is in the kits? A: The kits provide the necessary supplies you will need for your classroom in order to conduct the labs that are referenced in the Student Science Journal. Some science equipment, common household materials, and food items may not be included. For example, live bait will need to be ordered. For the best classroom results, preplan and review each lab to confirm that you have the supplies and equipment you need in order to execute the lab properly. Non-consumable materials should be saved and reused every year. Consumable materials will need to be reordered as needed. Consider organizing materials in labeled bins or bags, so that they can be found easily. Q: Where can a teacher or associate find the online Teacher Resources referenced in the By Design Science Teacher Editions? A: At the time an order is placed with Kendall Hunt, you will be instructed to fill out a form that is included with the Order Form that will allow you to access the Teacher Resources site. Q: How do I, as a customer, get access to the By Design resources, especially the eBooks? A: To access the resources you will first need to purchase the program. The By Design Science program Order Form is available on the SDA/By Design Science website. This requires that information be provided so administrators and teachers have proper access to the site as well as the grade-level resources that the school has purchased. After the purchase is made, the person who has been identified as an “administer” will receive an email from the Kendall Hunt web master directing that person to log in and access the site. Kendall Hunt continues to work with the adoption schools to help them access the online resources. Please note that if schools are having trouble with access to these resources, please feel free to have them contact Kendall Hunt to guide them through the process (bseymour@kendallhunt.com). Q: How do we use the eBooks? A: A “How To” video tutorial is available on the Teacher Resources site to help navigate the user through how to use the eBooks. The eBooks are located within each grade level. First, select a grade level to locate the appropriate eBooks. The enhanced eBooks are available as a Flash application for PC and Mac, and as an HTML application for iPad. These also support Android devices. Support will be limited to Android 4.1 devices running the Chrome browser and requires a minimum screen width of 600 pixels. Supported tools and devices include Mac, PC, iPad, Tablet, Kindle, and Samsung Android. The Flash application contains the following features: The navigation bar provides tools (icons) that link to many features and resources, including Search, Bookmarking and Highlighting, Note Taking and Notes Library, Zoom-to-Rectangle, Zoom In/Out, Page Next/Back, Double/Single Page View, and Help. There are also links to the New Kings James Version of the Bible as well a link to resources provided by Encyclopedia Britannica. The iPad application contains the following features: The Table of Contents menu containing links to specific pages and resources such as: Search, Highlighting and Highlighting Library, Note Taking and Notes Library, “Interactive Glossary” tool (text only), Pinch to Zoom In/Out, and Swipe Page Next/Back. There are also links to the New King James Version of the Bible as well a link to resources provided by Encyclopedia Britannica. The iPad application contains a menu listing links to media, and various media types are linked. Opening By Design Science eBooks on an iPad: The eBooks were designed to open in a new window. The iPad treats these windows as pop-ups. To be able to view the eBooks in Safari, you must disable the pop-up blocker by following these steps: (1) Open the “Settings” menu on your Home screen. (2) Tap the “Safari” tab on the Settings page. The Safari preferences screen loads. (3) Scroll down the page to the “Security” section. (4) Slide the “Block Pop-Ups” switch to the “Off” position. (5) Press the “Home” button to return to your Home screen.